The Project Adventure Pages are Here! It is with equal parts excitement and trepidation that I begin my next major project: I am going to attempt to make a winter weight, lined coat from the Pavot Jacket from the French pattern company Deer and Doe. I’ve never attempted a clothing project this big before, and I am definitely intimidated! Why, you ask? Well, there are just so many variables that go into making a coat. What kind of interfacing should I use? Do I underline it for warmth? 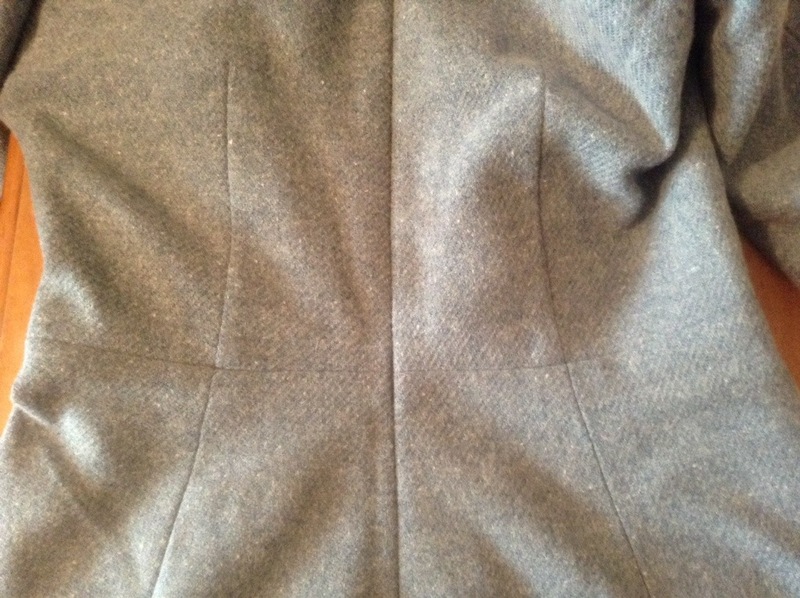 Do I need to use special tailoring techniques? The list goes on! I have done a fair bit of reading via blogs and sew-alongs, so I thought I’d give you a little list as “food for thought” should you also be diving into this madness. 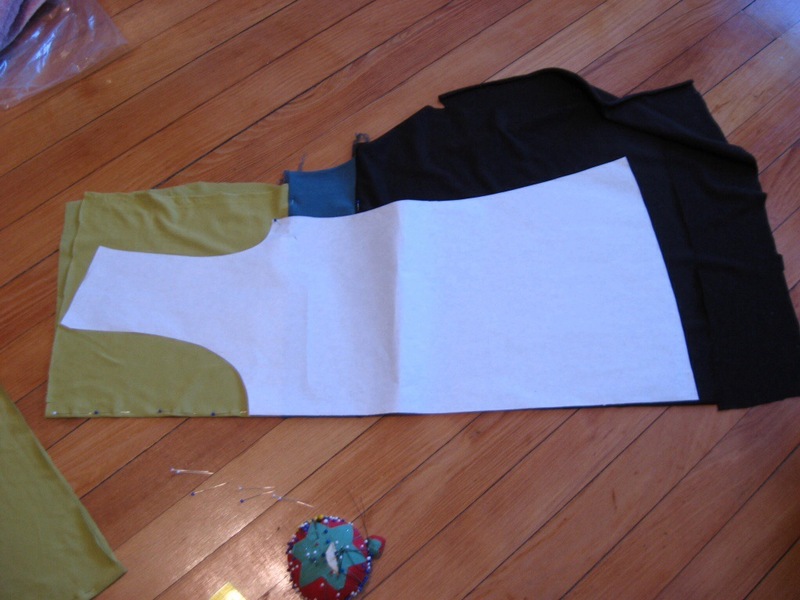 The Great Coat Sew-Along – an intensely detailed site about all the possible steps of making a coat. It’s kind of overwhelming, but I highly recommend it nonetheless. 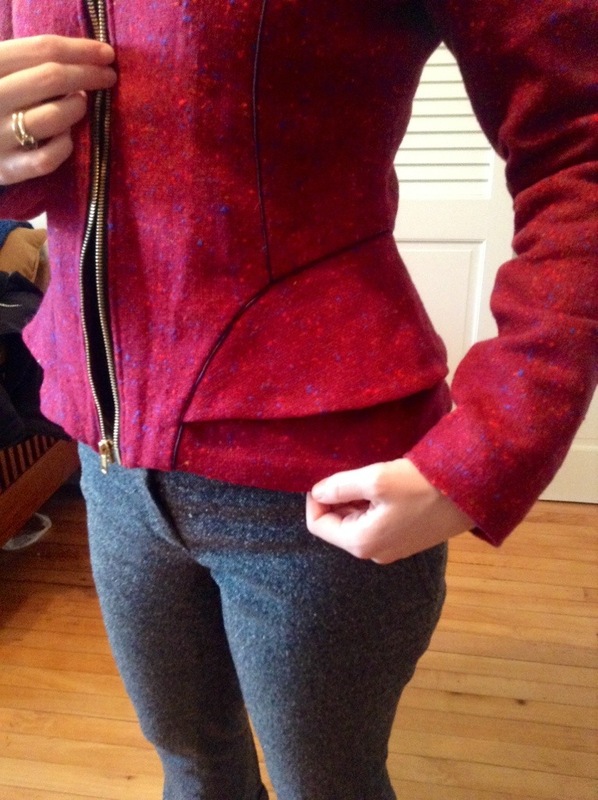 Lauren’s Vogue Coat – she includes lots of helpful details and pictures of her coat making process, and even makes it look doable! Jen’s Coat Making Post – talks about the various details that go into a coat, such as what to interface and how to work with wool coating. Super helpful! The Craftsy course Underneath It All – I went through the whole thing before starting, and have already rewatched parts. 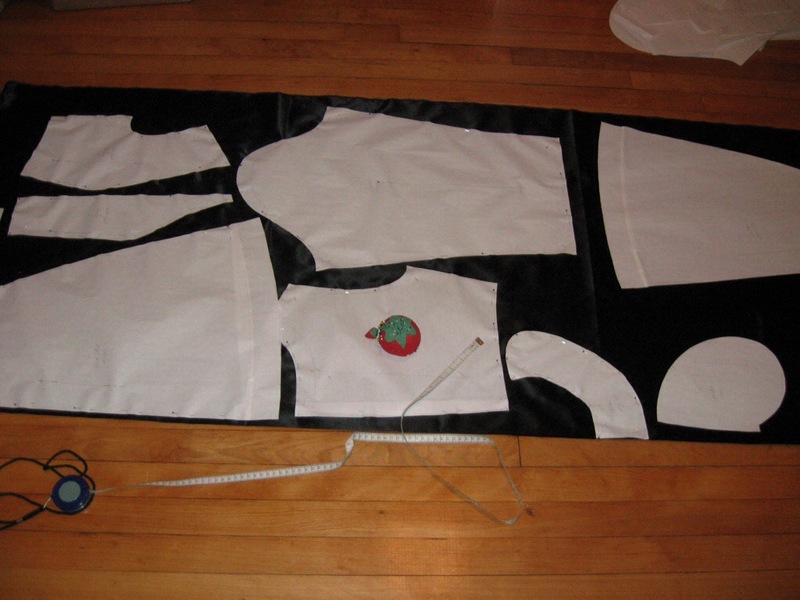 And it covers way more than just making coats – you learn all about interfacing, lining, and underlining. Seriously, do yourself a huge favor and take this course! Ok, I think that’s enough information overload for now. More to come soon! No, not plantain the banana-like tropical fruit; I mean of course the new FREE pattern from Deer and Doe, the Plantain Top! This is my first time taking part in making a brand new, hot-off-the-press pattern, and it really was fun! 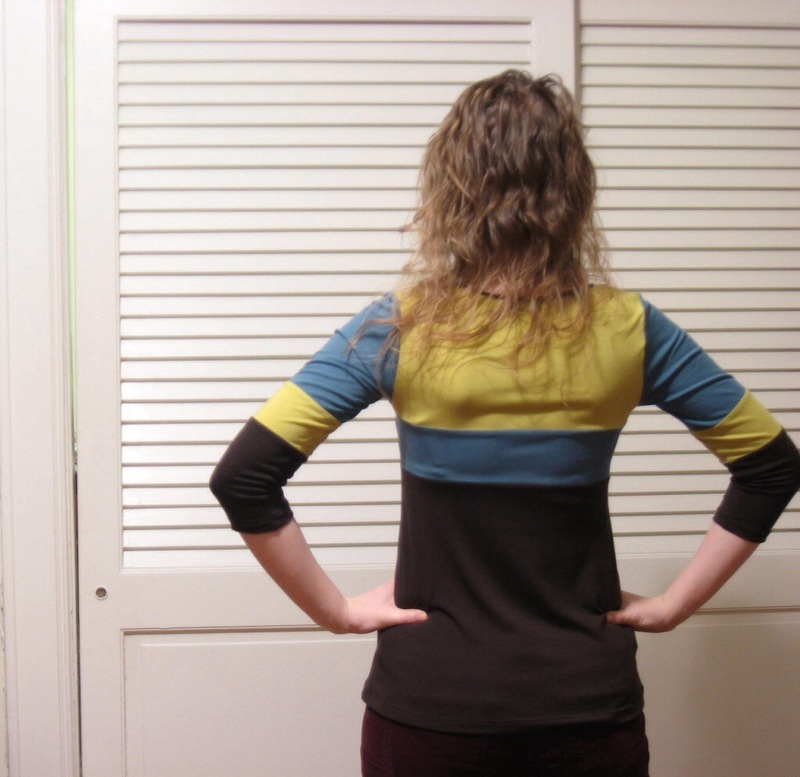 The pattern has a wonderful fit: fitted through the top but relaxed through the bottom – perfect for gals like me with a little bit of a tummy who get tired of trying not to let it show in public. And it’s super easy to make, too! A major “win” all around. Success! So, after checking the fit with my muslin, I really wanted to come up with something awesome for the Plantain Challenge – my first sewing “competition”! I had originally planned to make a top out of a beautiful ivory sweater knit I recently bought, but the fabric was mysteriously marred during prewashing (has anyone ever discovered stains on their fabric as a result of prewashing??! This is truly a mystery….I’m wondering if some of the dye pooled up as the fabric was drying?? 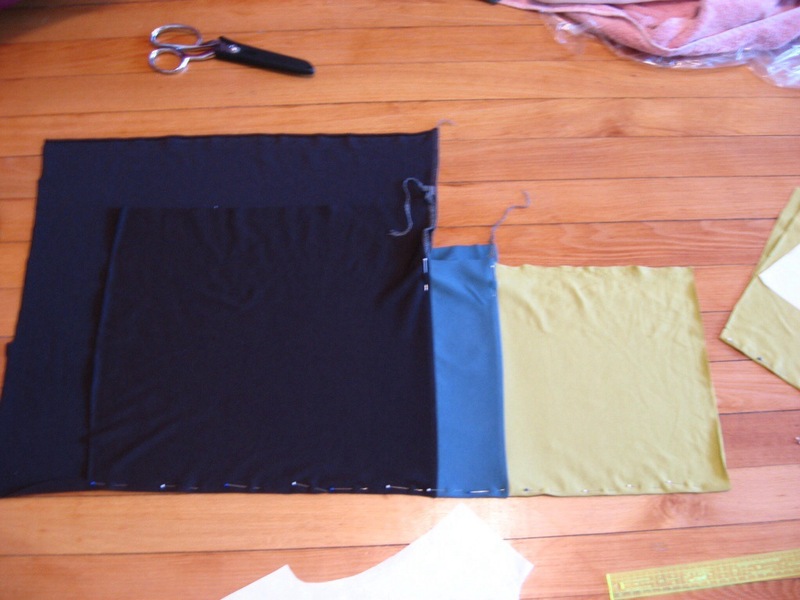 ), so I had to figure out something with the fabric I have on hand. So I decided to try colorblocking some remnants from my stash, and it worked surprisingly well! So if you haven’t downloaded this top already, go do it!! It’s easy, flattering, and super quick to make! 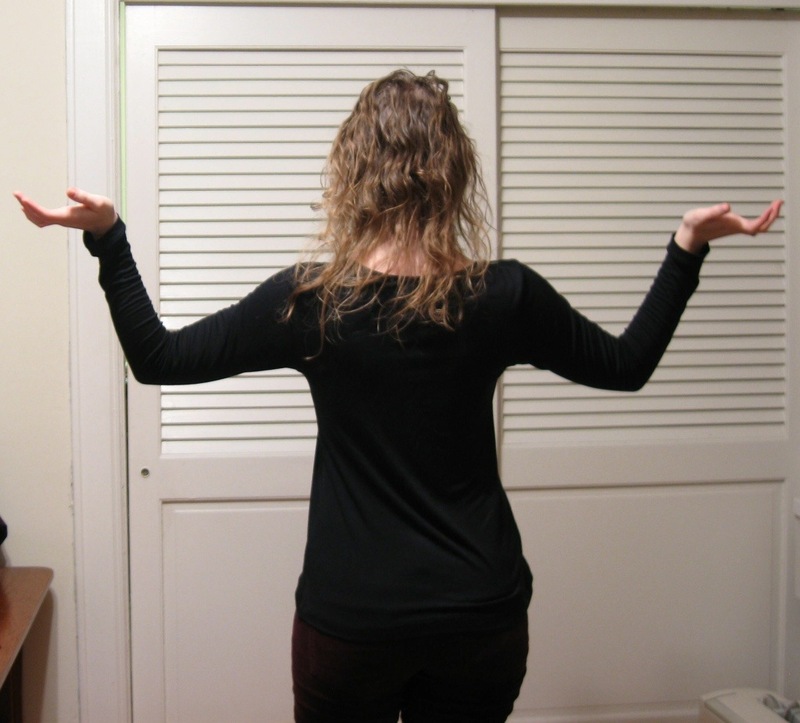 Note: today’s post is more about ideas than finished outfits…bear with me as I ramble. But I still love to sing, so what does that mean? Do I sing as a hobby? For some reason I find myself uncomfortable with that word. We associate “hobby” with “dilettante” – someone who’s not good enough to be a professional, someone less skilled or talented than “the real thing.” But is that really how we have to view our non-professional endeavors? As I’ve been getting back into sewing, I’ve started to rethink my definition of “the hobby.” Sewing is something I love, something I strive to improve, and most of all, something that brings me joy. It is something I take very seriously, not just something I dabble at. But I’m not a “professional seamstress” – I don’t have professional training, and no one pays me to do it. Does that really matter, though? Perhaps I am defining my own roles too narrowly by putting things in the “career” vs. “hobby” box. Over Christmas break this year, I found out that my high school voice teacher had passed away from cancer. I was devastated – she was the first person to truly believe in me as a singer. I felt that I had let her down by not turning into a professional singer, by going a different route than I has originally planned. But then as I thought back to my lessons with her so long ago, I remembered the most important thing she taught me – what it felt like to love singing. She taught me joy. Those memories helped me rediscover joy in my singing – an element that higher education and the pressure of a career had taken away from me. So do we need to be “professionals” in order to be serious about something we love? Obviously not – yet when we think more about our current psychology of the amateur vs. the professional, there does seem to be this fundamental rift – we have to be a professional to be taken seriously. It doesn’t have to be that way, though. In fact, the word “amateur” comes from the Latin root “to love.” So to be an amateur singer, or seamstress, simply means to love that thing; it doesn’t imply a lack of skill or talent. In fact, I think we all need hobbies – those passions that we pursue simply for the joy of doing it. Of course, you can also love your professional career – I don’t mean to imply that you can’t! – but I’m starting to wonder if some of the things we love and cherish the most should actually be our amateur endeavors. While I find my job as a ballet accompanist deeply satisfying, it’s still a job, with all the pressures and frustrations that come with that. But my singing and my sewing are mine. I can love them the way I want to love them, and use those skills and talents however I want. So I will proudly call myself an “amateur” singer and seamstress. There is no reason to be ashamed that these are hobbies for the moment. And who knows – perhaps at some point one or both of those will become professional pursuits as well? But for now, I can be satisfied knowing that, professionally or non-professionally, I am doing the things I love most. I had posted a week or so ago that I was working on an Anna Dress that just wasn’t going my way. Well, it took some coaxing, but I finally worked out the kinks, and a dress I thought I’d never wear has already turned into a dress I love! Ta-da! This is the second garment made from the wool I inherited from my mother-in-law, so I wanted to make sure it would be something special that I would wear a lot. 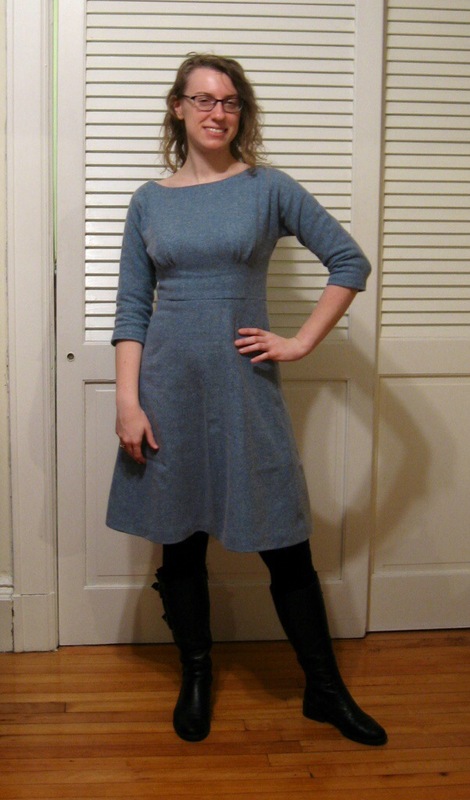 And what could be more wearable during a cold Boston winter than a wool dress?? However, I did have several fitting conundrums while constructing this, so I wasn’t sure if this venture was going to end well. First of all, I made a size 6 for the entire bodice instead of grading from a 2 to a 6 like my last one. I also made a slight sway back adjustment to bring the back waist up to the front waist level. 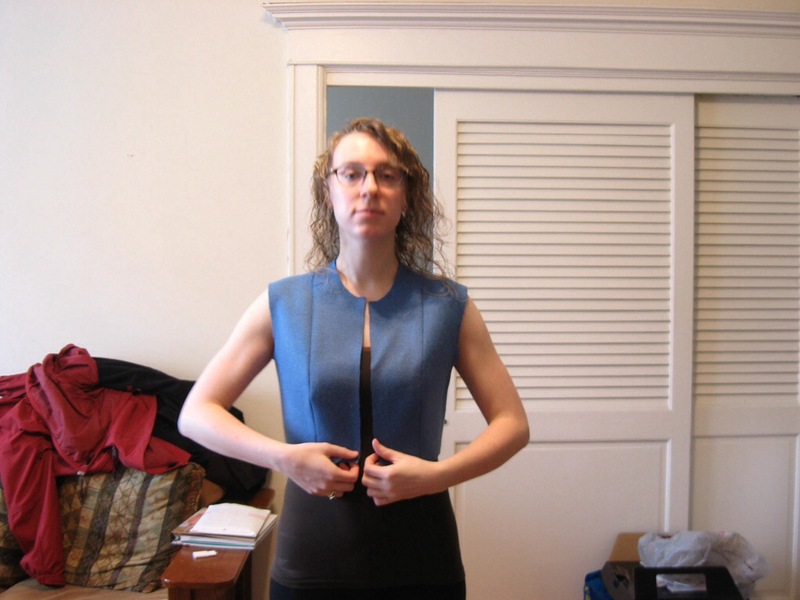 Next, I made a muslin of the bodice, which fit well, so I cut into my fabric and went for it. However, the more loosely woven wool fit very differently than the cotton muslin, so when I tried on this version it was way too baggy at the bust, and generally made me look like a big blue stuffed animal. The sleeves were also totally wonky, and fell back on the shoulders far too much. I put it aside in disgust for a few days trying to figure out where I went wrong. 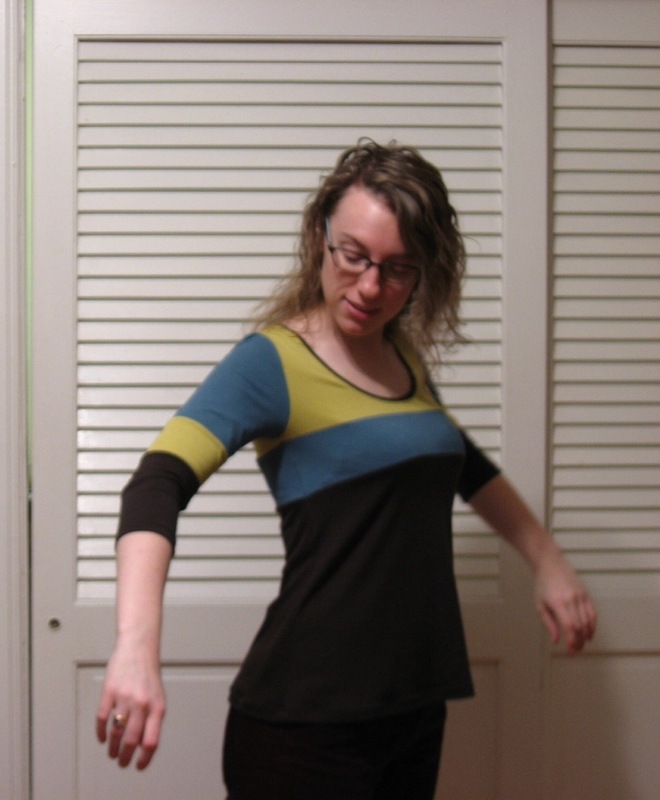 I eventually ended up taking about an inch off the front neckline (to get the shoulders to sit correctly) and took in my shoulder/sleeve seam about 3/4″ at the shoulder, tapering to nothing at the end of the sleeve. That seemed to take care of the extra fullness in the bust, and tightened up the sleeves just enough so that I no longer looked like a giant blue teddy bear. 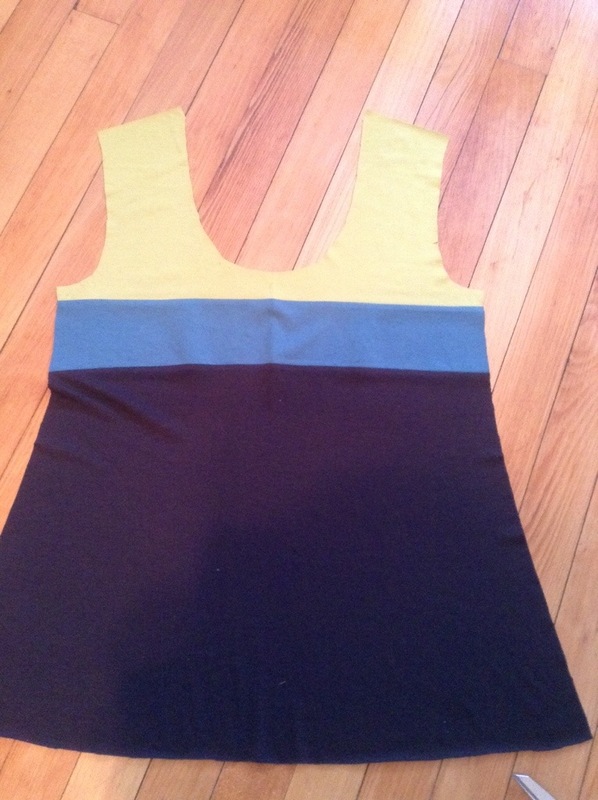 Now for a few detail shots – I was quite proud of how well I got all the seams on the bodice to match the skirt. 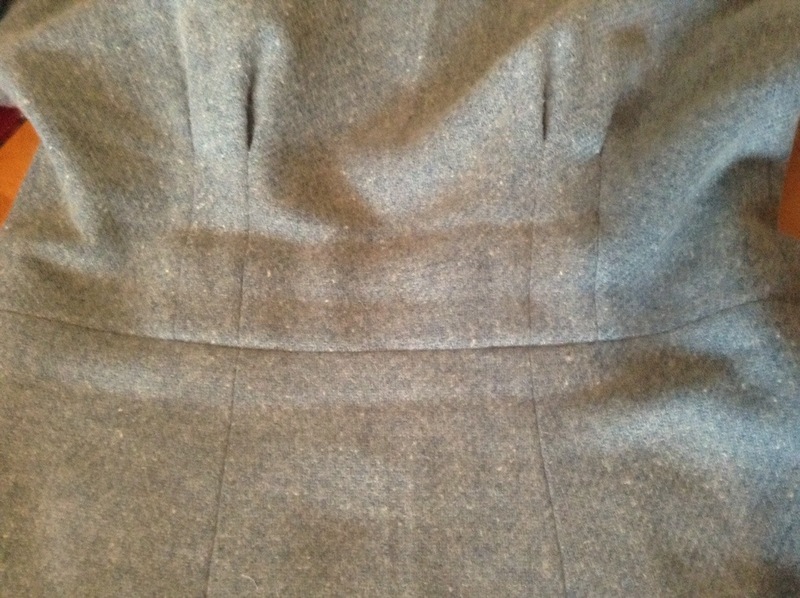 I even managed to match the waist seam at the invisible zipper – woot! 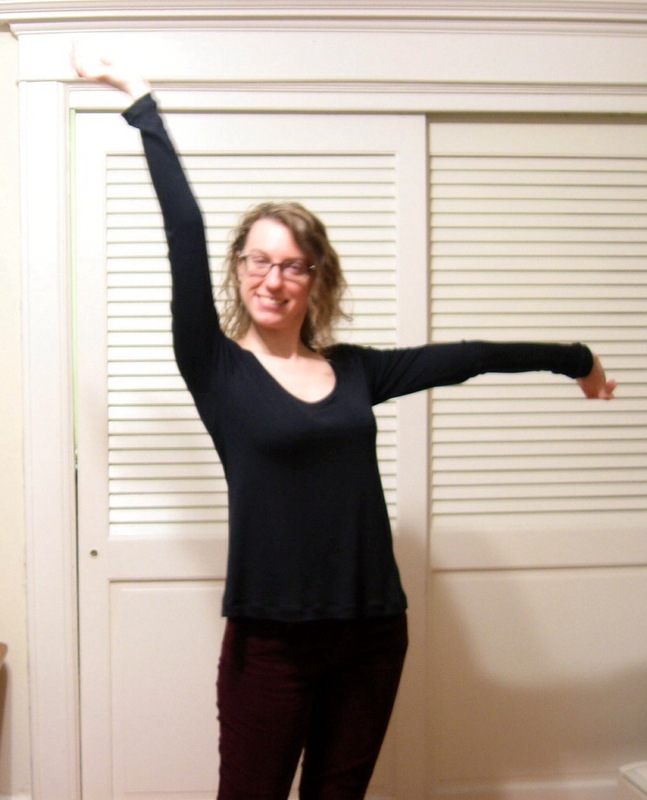 I may end up shortening the sleeves for practicality – I keep finding myself pushing them up due to some tightness at the elbow. But all in all, I’m quite pleased with my winterized Anna! Hooray! Trying out a new pattern is always an exciting process, but for me it’s also always a little scary. This is especially true when trying out a new pattern company! Today’s dress is from By Hand London, an indie pattern company that pretty much everyone has heard about at this point. 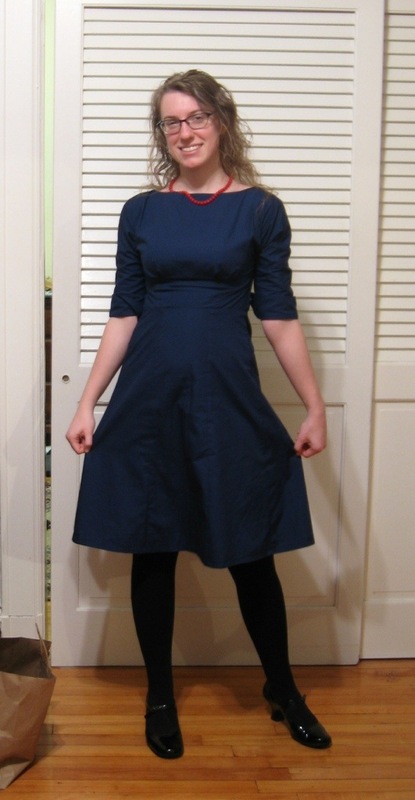 I’ve noticed that the Anna Dress has really been making the rounds in the sewing blogosphere lately, so I figured that meant I had to try it. I was a little scared of this pattern, though, as it seems like it was intended for an “hourglass” figure. 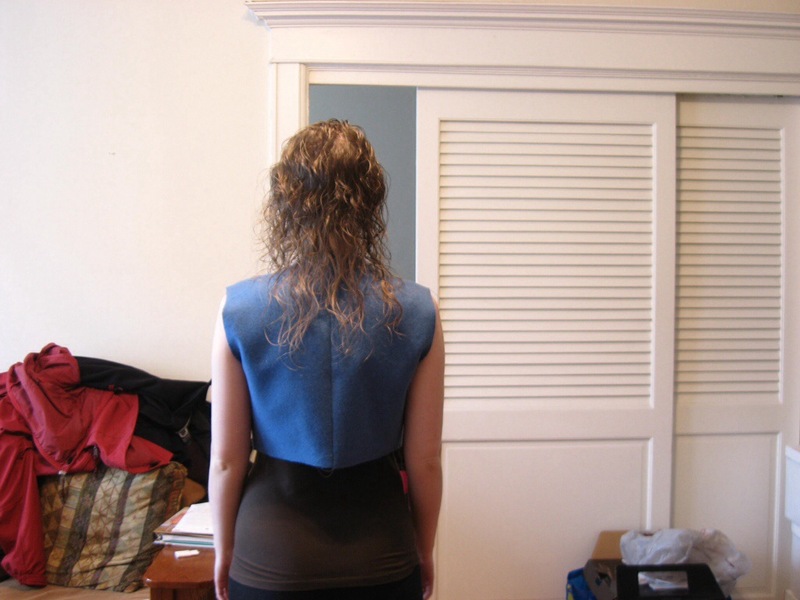 Alas, I was not blessed with the tiny waist and ample bosom that most young sewing bloggers apparently have! So, I knew I would have to make some alterations. 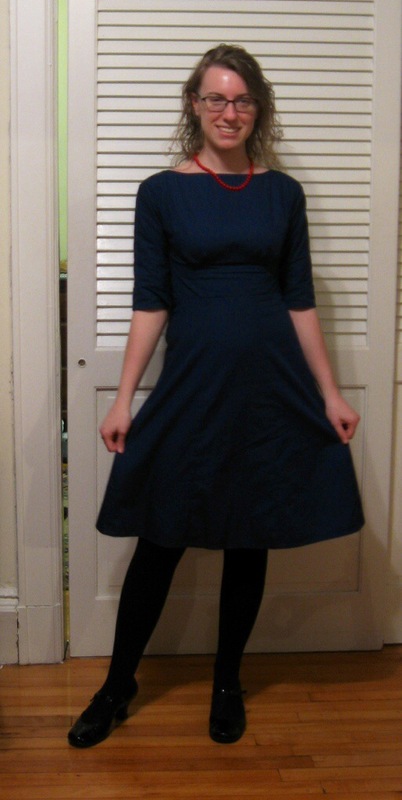 This dress was my “wearable muslin,” which worked out pretty well, but I still have a few issues with it. Now, you may notice that this dress has sleeves but the pattern doesn’t. This is a fun little twist that the gals at By Hand London added to their sew-along – you can find the pattern details here. I also added turn-back cuffs because the fabric was too tight around the elbows, but I wanted to have the option to have slightly longer sleeves when I wanted. I used this tutorial for the cuffs. It’s a fun little detail – you can’t see it that well from the pictures, unfortunately, but it was a nice little experiment. I would also like to note that I took these photos BY MYSELF using my new friend, the self-timer! Woot! I have another Anna dress in the works, with a whole different set of issues (that was the Anna dress to which I referred in my last post), but that will have to wait for another day. So long for now! I had mentioned a few posts ago that it was one of my 2014 goals to take better pictures for this blog, which gave me the motivation to finally get over my laziness and fiddle with my camera! Yes, I already have one, but since I now write my posts from my ipad, I needed a way to get my ipad and camera to talk to each other. Thankfully, the friendly folks at the Apple store set me up with some (overpriced…?) gadgets that got me off the ground again. (Note: the Apple store folks in Boston really are friendly! That was a pleasant surprise in and of itself!) So now hopefully my photo quality will improve. And now for my first make of 2014! I’m currently struggling in the midst of a few projects that are either huge and intimidating or just not going my way. I made a muslin for Deer and Doe’s Pavot Jacket that I want to turn into a fully lined coat, but now am too intimidated to start! 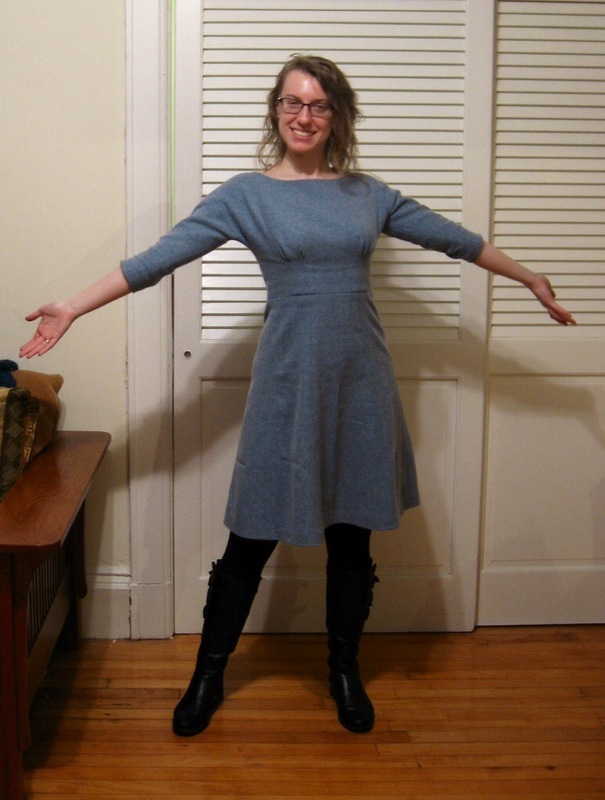 I’m also slogging through a wool, 3/4 sleeved Anna Dress that just does not fit right. So, with these two current UFOs weighing me down, I needed something fun and easy that I could feel good about. 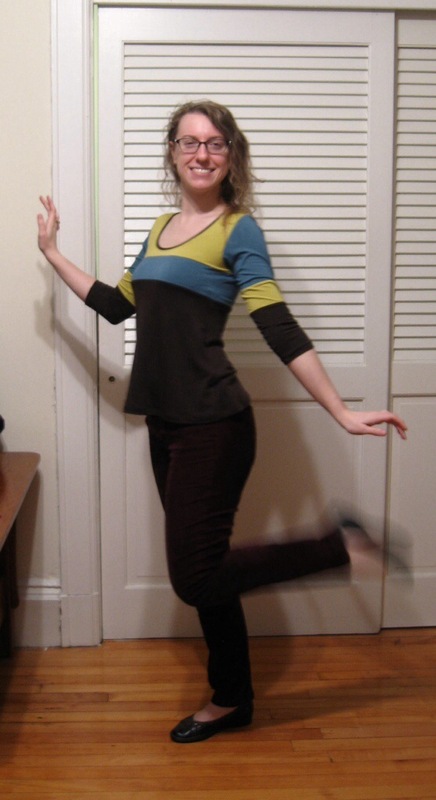 Sewaholic patterns seem to fit me like magic, so I got my hands on her Pendrell Blouse pattern and went at it. Finally, a project worked out! 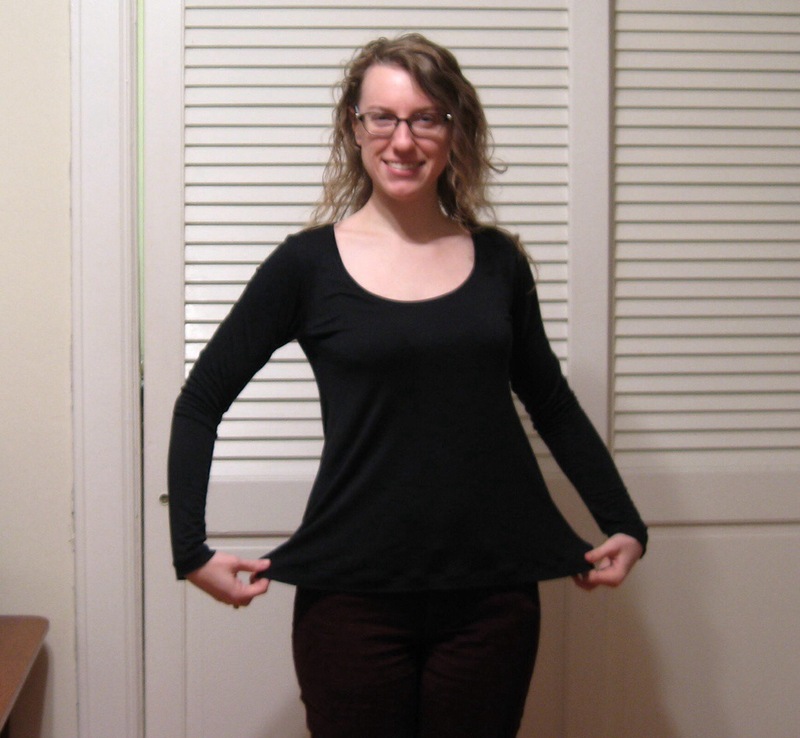 I did end up making it smaller than recommended…I used to think I was a Sewaholic size 4, and have made all my patterns to date in that size, which has worked perfectly. 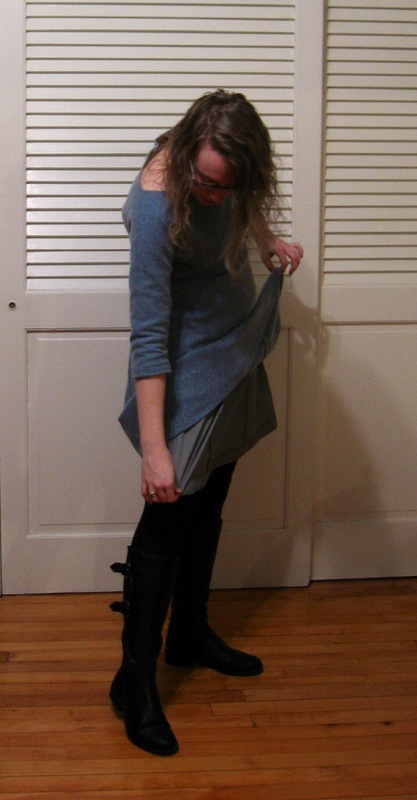 However, after re-taking my measurements over the holidays with my mom, I realized I should be sewing a size 8 – oops! However, since the 4 has worked so well in the past, I went ahead with it, and I think it worked out well. It’s supposed to have a very relaxed fit, but I think I like a slightly more fitted look. I did take out a little at the bust on the side front piece, as I was getting some odd drag lines around the sleeve area. 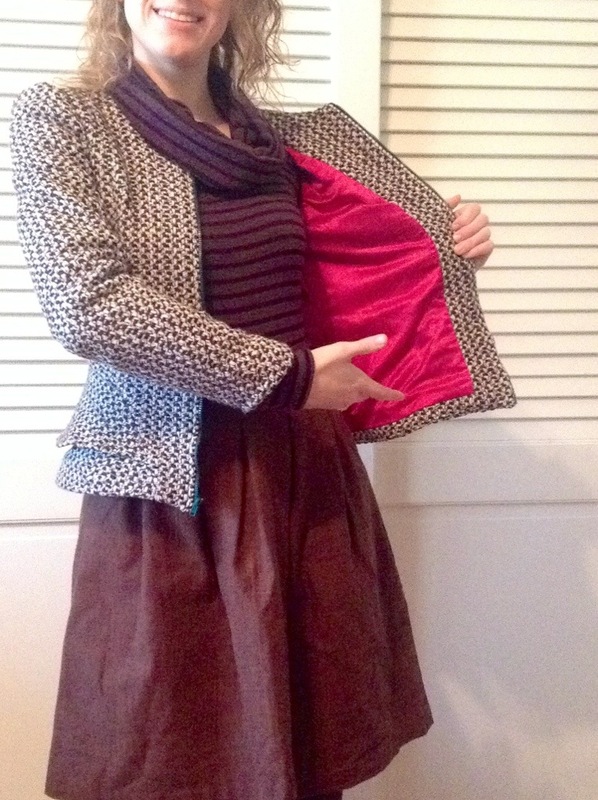 The fabric is a silk charmeuse that my mom gave me from her stash over Christmas – yay for inheriting fabric! I had been coveting that piece ever since I was a teen, actually – she had used it to make a gorgeous costume for a homeschool Shakespeare play I was in, and I fell in love with the drape and color. After wearing it for a day, the blouse developed some more weird folds around the bust – I think that the ruffle might be weighing the seam down too much. I’ll play around some more at some point, but for now, I’m glad I have a finished product I’m happy with! I’m finally getting to the point with my sewing where I can create entire outfits from my handmade wardrobe! Woot! It’s kind of like a fun, wearable resume of my sewing skills. 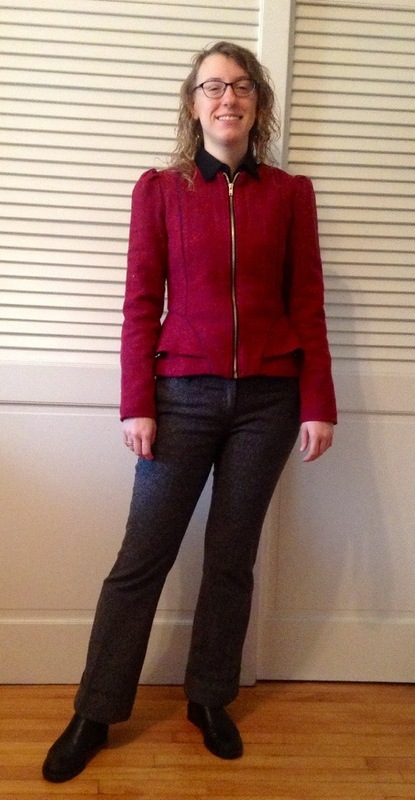 Today’s outfit is a perfect example – it shows off sewing with knits, using my serger, sewing a jacket, and getting the fit right. 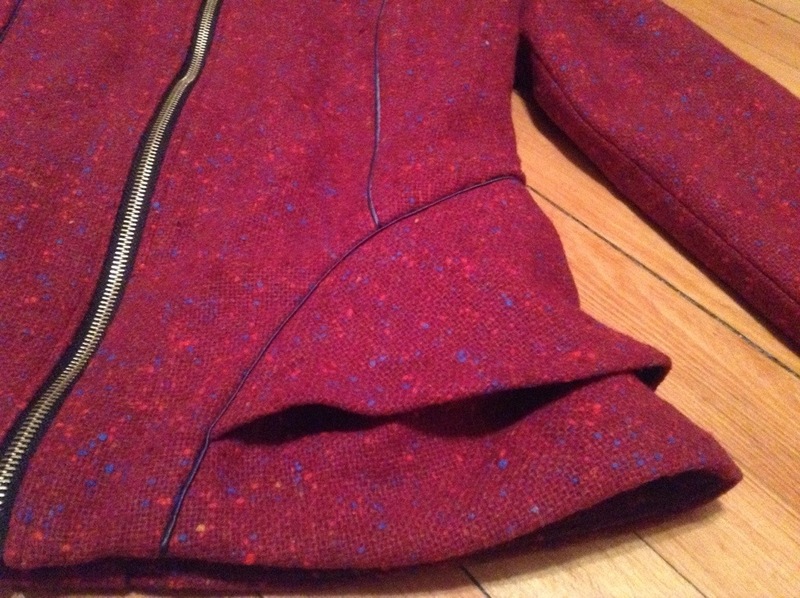 The fabric is a much higher quality than my first lining attempt, which meant that it cost more than the rest of the jacket put together, but it was well worth it – it’s wearing beautifully with no signs of tearing. Hooray! And the extra practice sewing a lining will certainly come in handy in the future! 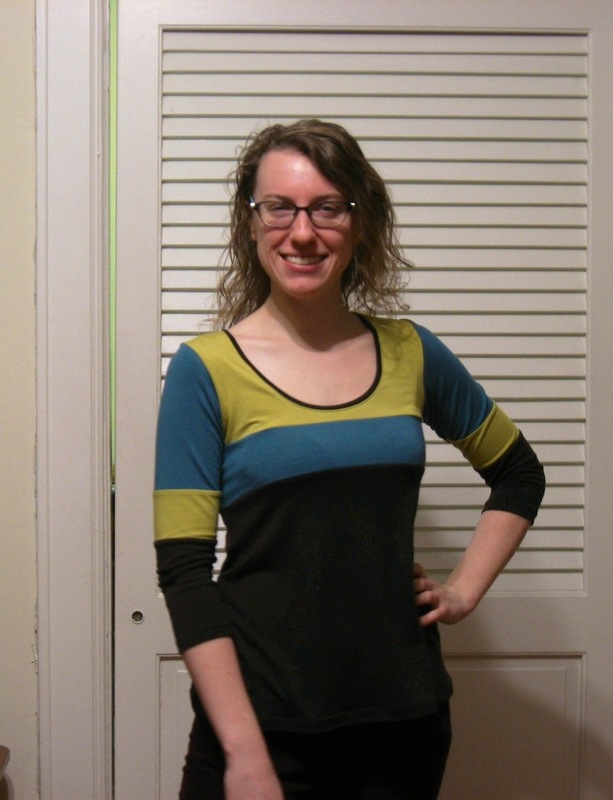 The sweater is the Sewaholic Renfrew Top, another favorite pattern of mine. 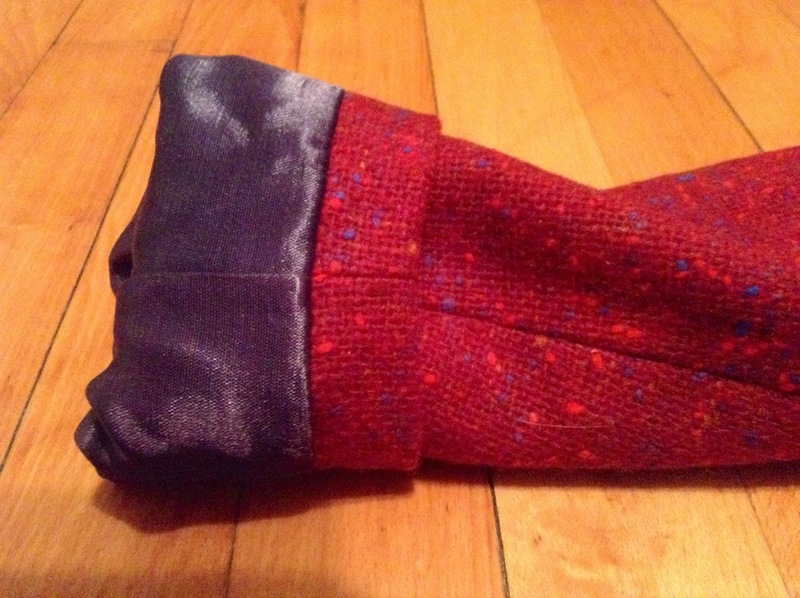 This particular incarnation was also my first project with my new serger. It has so many construction issues I’m honestly surprised I can stand wearing it, but it’s so warm and the fabric is so fun that I can overlook what a mess I made of it! None of the stripes match anywhere, in spite of my best efforts (I learned later to machine baste matching stripes with my sewing machine before feeding them to the serger), and the seams actually started pulling out at the ends because I had the wrong differential feed on and the wrong stitch – oy! But with a little help from my sewing machine, I got it in wearable condition, and it even made it through the washing machine unscathed, so I’ve decided it’s enough of a success to wear. 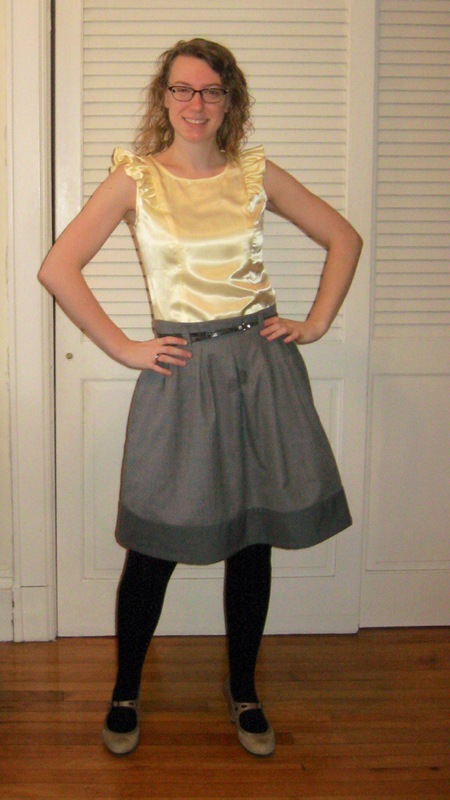 Lastly, the skirt is the adorable Deer and Doe Chardon Skirt, in the correct size! It’s flannel, it’s warm – what’s not to love? Happy New Year, everyone! I realize I haven’t posted in a while – the holidays caught up with me for a bit there! But I’m back to work now, so I’m back to blogging, too. My latest project I actually finished before Christmas – I wanted to wear it to the Christmas Eve service at my parents’ church when I visited them, and I got it done just in the nick of time! (I think I completed it on the 22nd or so…) I took longer than usual on this one – two weeks! – since I wanted to take the time to be meticulous. This is my second version of the Sewaholic Cordova Jacket – a truly fantastic pattern that I can’t recommend highly enough! 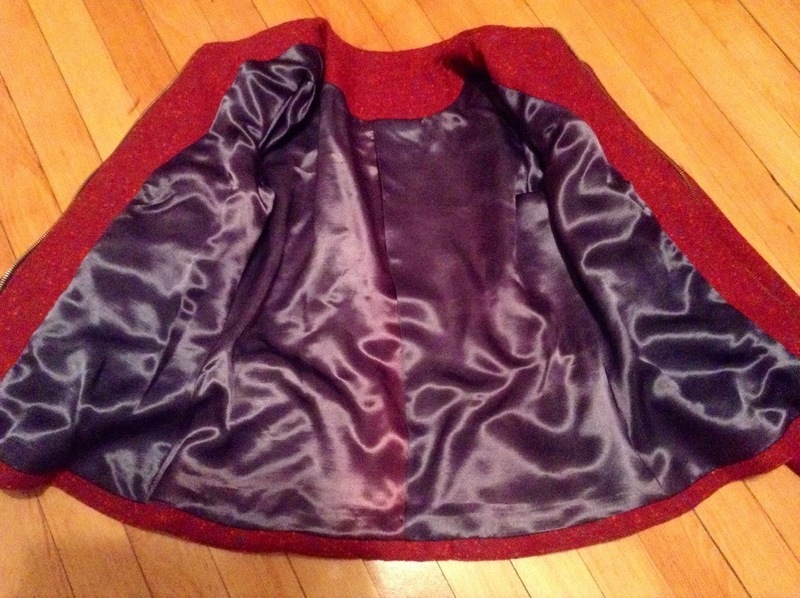 I added piping to the princess seams and peplum this time around, using the lining fabric as piping. 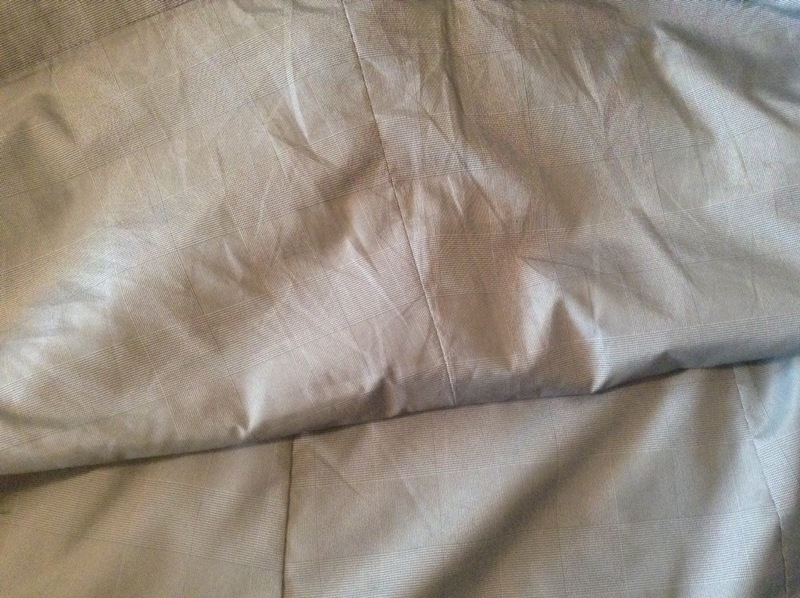 I did flat piping instead of corded piping, which just means I took a bias strip and folded it in half. Cake Patterns has a great tutorial herem which helped a lot! It took me a few tries and a few ripped-out seams to get it right, but it was well worth the extra work to get a precise result. Here she is! Lots of detail pics…can you tell I’m super proud?? Also, when sewing the lining, a took Tasia’s tip on machine stitching the sleeve lining in place (part of her Minoru Sew-Along), which I loved, and also used to fix the lining on the first Cordova. I love it! One last comment on the jacket – the fabric is a beautiful vintage wool that I inherited from my mother-in-law over Thanksgiving. She gave me several great wool pieces, which will be making their debut in projects to come! -I want to use better photos for my blog. I’ve been using my ipad camera so far, and it’s fine, but I would love crisper, more detailed pics of my projects. I’m not sure yet exactly how I’ll accomplish this, but it’s a goal! -I want to overcome my fear of fit. So far I’ve gotten lucky, but I know that won’t always happen! So my goal is to take the time to make a muslin and adjust it until I get the fit right. One reference I plan to use are the great videos on the Threads Magazine website! -speaking of Threads, I also want to go through their entire Insider Techniques video series and get serious about learning the tailoring and couture details that will give my projects a more professional look. -I want to read and sew through the entire Colette Sewing Handbook, which was a wonderful Christmas gift from my mom! -and lastly, I want to work on connecting with other sewing bloggers. The sewing blog community is a wonderful place for support and ideas, and I want to be part of it!